SEARCH IS NOW CLOSED FOR QUEEN'S TOP GRADUATE AND STUDENT! Queen’s University is currently on the lookout for this year’s exceptional graduate and student! Nominations for the 2017 First Trust Bank Queen’s Graduate and Student of the Year Awards HAVE CLOSED. The organisers want to hear about graduates who have made a substantial impact on the arts, science, business, sport or public life or a significant contribution to others, and about students who have done something amazing during their time at Queen’s. One in 12 adults in Northern Ireland is a graduate of Queen’s University – so over 100,000 alumni are out and about in local communities making a real difference in people’s lives. In addition over 30,000 Queen’s graduates have left Northern Ireland and are making a real impact on lives of others around the world. Queen’s students are distinguished alumni in the making. Every year thousands of students make a positive impact by participating in community service projects, internships and volunteer activities both on and off campus. Last year’s Graduate winner was London-based Northern Ireland man and 2005 BAFTA winner, Jonny Bramley (above left) who, as a senior television producer has worked at 13 Olympic Games and been responsible for the BBC’s coverage of Wimbledon, the Open Golf and the Ryder Cup. 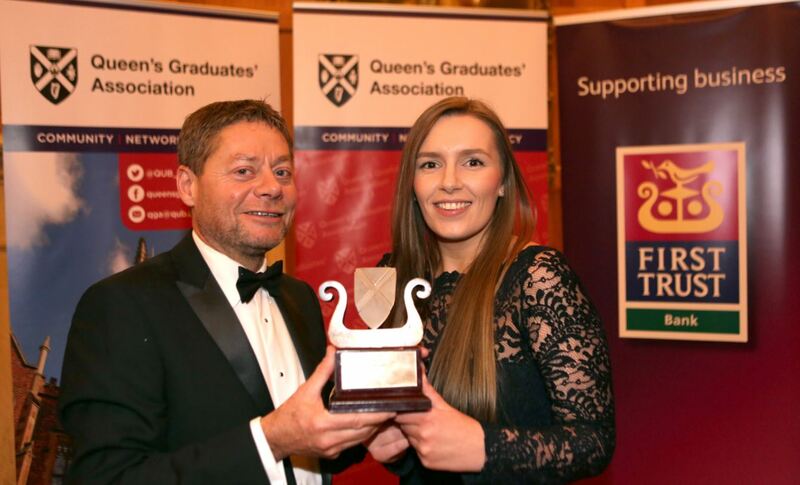 The winner of the 2016 Student of the Year Award was the exceptional Computer Science MEng student Diane Murdock (above right) from Co Down, who was chosen for her contribution to the IT sector within Queen’s and for representing the University at conferences and events in London, France and Malaysia. The annual Graduate and Student of the Year Awards were launched in 1999 by the Queen’s Graduates’ Association (QGA) and the University’s Development and Alumni Relations Office, with the generous support of First Trust Bank. The Bank’s endorsement further recognises and celebrates the achievements of outstanding Queen's students and graduates, who make such a valuable input to life in Northern Ireland and beyond. Those nominated for the Student of the Year Award should have made a significant contribution to the life of the University – or to the lives of others – during their time at Queen’s. In the past this Award has gone to individuals and also to groups of law, medical and engineering students.In addition to a trophy, the Student winner(s) will receive a cheque for £500! Nominations for individual – or groups – of graduates should be for those who have made a substantial contribution to the arts, sciences or business or to sporting, public or academic life. Entries for those who have made a significant contribution to the lives of others, or to the life of the University, can also be considered. Previous graduate recipients have come from the fields of broadcasting (Jonny Bramley), rugby (David Humphreys), GAA (Kieran McGeeney), business (Dr Anita Sands), the arts (The Priests) and the law (Lord Brian Kerr). The 2017 nomination process is NOW CLOSED. The Awards judging panel consists of representatives of the QGA, the University, the Students' Union and First Trust Bank. The judges stress that academic qualifications, high office or fame are not prerequisites to winning; they will also be looking for nominations that are novel, courageous, innovative or even bold. The Student Award will be presented on Saturday 01 July during summer graduation week, while the Graduate of the Year will be recognised at the annual Charter Day Dinner on 24 November, organised by the QGA. For further details visit the Awards web page or contact Alumni Relations Officer Natasha Sharma, tel: +44 (0)28 9097 3135.